Amenity-Filled, 4BR/3BA, Luxury Home - 5 Minutes to Disney! Villa Fantasia #3 is professionally decorated and landscaped. It is a four bedroom, three bath, home, just two miles from Disney's door. 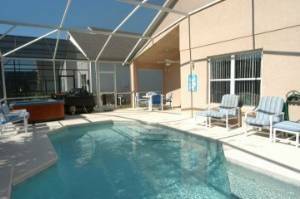 Enjoy your own in ground heated pool, hot tub, and loaded, air conditioned, game room. It has lush landscaping, on a quiet street. The pool and deck area is fully screened. It features an in ground heated pool, a five-person hot tub, four loungers, outside dining table, and a propane barbecue grill. The lanai is accessed from two different sliding glass doors. Villa Fantasia #3 has four bedrooms. Two master bedrooms, each with king-size bed, private bath, and cable TV. Two bedrooms, each with twin beds, cable TV, DVD/VCR combo, one with a Playstation 2 with games, the other with an X-Box with games. These two bedrooms share a bath. There is a hair, blow dryer in each bathroom. There also is a crib, high chair, double stroller, and a booster seat available at no charge. The kitchen is fully-equipped with all modern appliances, pots, pans, dishware, glassware, tableware, utensils, and a side-by-side refrigerator. There also is a full-size washer and dryer, and an iron with ironing board, in the laundry room. The living room has a 27 inch TV, with cable, DVD/VCR combo, and a Sony Playstation 2. There also is a queen-size sleeper sofa. All your bath and pool towels, and linens are provided. For your security, there is an alarm system, and a wall safe for your valuables. Fantasia #3 is fully finished, air conditioned, game room is incredible! It has an seven foot, commercial, billiards table, a top-of-the-line foosball table, an electronic dart board, Vegas-style Poker Chips with playing cards, chess, checkers, backgammon set, a TV, a stereo CD player, and a computer with free, "High Speed" internet access at no charge. That is right, no charge! So you can check your e-mail, find discount tickets, make dinner reservations, or get directions, it is on us. Whether it is raining outside, or if you are back from a long day at the attractions, you can play to your hearts content in your own private, air conditioned game room. No other rental home can offer all that Villa Fantasia #3 does. Every convenience has been thought of, and is at your fingertips. 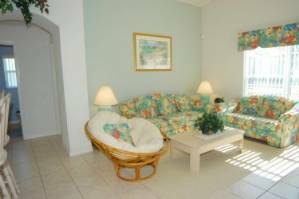 Adults, teenagers, or children, one family or two, this home accommodates everyone. 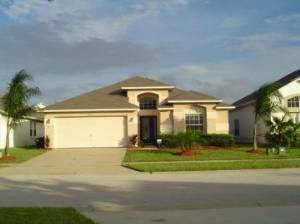 Villa Fantasia #3 is located in Oak Island Cove, Kissimmee, Florida. 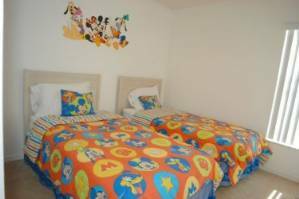 Oak Island is actually two quiet residential developments, that are situated just five minutes away from Disney. Oak Island Harbor and Cove communities are exclusive developments situated with lush green walks, ponds lined with reeds, and visited by white Herons and Egrets. Oak Island is located off Highway 192 West at Mile Marker #4 - approximately two and a quarter miles from the Disney theme parks. Perfectly situated less than two minutes from the Formosa Gardens Shopping Center, with its' great restaurants, shopping, or 24 grocery store. Your never far from a great night out, or a midnight snack. We can get you on Disney's property in under five minutes without going on a highway. How is that for close?! Want to go grocery shopping, get breakfast, lunch, or dinner... One minute away, no joke! We are close to everything! Golf, Disney, Universal, Sea World, Orlando, the airport, you name it, it is close by. See for yourself. Villa Fantasia #1, Villa Fantasia #2, and Villa Fantasia #3 are all located in Oak Island Cove and are within two blocks of each other. We can accommodate up to 34 guests in our three homes. So if your planning a family reunion, going to a convention or a sporting event in Disney, you can save a small fortune staying with us as opposed to booking numerous hotel rooms. Phone, Air Conditioning, 7 TV's, Cable TV, 3 VCR/DVD Combos, Stereo CD Player, 2 PlayStation 2 with games, X-Box with Games, VCR Video Library, fully finished game room with pool table, foosball table, electronic dart board, computer with free, "High Speed" internet access, crib, high chair, double stroller, booster seat, Full Kitchen, Microwave, Dishwasher, Refrigerator, Cooking utensils provided, Linens provided, including pool towels, Washer, Dryer, Private Hot Tub, Private Pool, Gas Grill (BBQ). Quiet street, palm trees, your home away from home. Your very own in ground, heated pool with a free standing hot tub, propane BBQ Grill,outdoor TV and plenty of patio furniture. Your very own, fully finished, air conditioned gameroom. 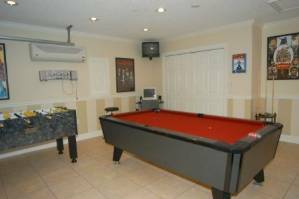 Pool table, foozball, electronic dartboard, TV, CD Player, and Computer w/free Internet Access. 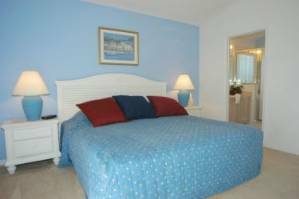 One of two master bedrooms with king sized beds and private bathrooms. Beautiful and relaxing Family Room with a 27 inch TV, DVD/VCR Combo w/50 VCR movies, Playstation 2, w/games and a queen size sleeper sofa. Your little people will love their bedroom. TV and DVD/VCR Combo and a Playstation 2. Your little people will love their bedroom. TV and DVD/VCR Combo and an Xbox w/games. The villa is the perfect location for everything you need. I am also looking forward to the next oppotunity i have to be able to come back. We had a great time, the ammeneties were good and as expected. The kids loved the pool and hot tub, movies and game consoles. The house has everything for 2 families (up to 5 members per family) to stay comfortable. We can't wait to make our second trip. Couldn't have been more pleased! 2 families (4 adults/3 kids) had more than enough room. Pool/Hot tub were perfect for relaxing after a day at the parks. TVs/DVDs in every room were much appreciated, and kids were very pleased with videogame & movie selections. Definitely will recommend to anyone visitng the Orlando area for any length of time. 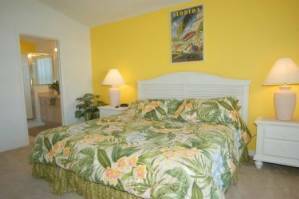 Very close to Disney property, restaurants and grocery stores. Hello. We are happy to add Villla Fantasia 3 as our third, and newest home for rental. Rest assured that it has all the same amenities as our other two homes. 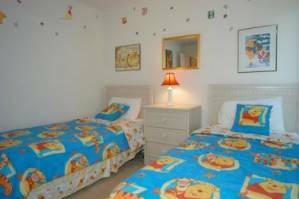 So take your pick, Villa Fantasia 1, Villa Fantasia 2 or Villa Fantasia 3, you have found your home away from home, 5 minutes from Walt Disney World. We hope to see you soon. Thanks. *Please plan and book early to guarantee the exact dates you desire. *Special discounts for repeat guests and last minutes bookings. *Discounts for stays longer then 10 days. * Use our online travel website and save 10% off our nightly home rental rates. Deposit: *$300 deposit required 90 days in advance to hold reservation. *$250 security deposit required, refunded 10 days after keys are returned, and home is checked for damage. Cancellations and Refunds: $300 Deposit is Non - Refundable *Balance is due 60 days in advance. *Once Balance is paid, it is Non-Refundable if cancelled within 60 days of check-in. We strongly suggest purchasing travel insurance. Check our web site for details. Other Fees: *$20 a day for pool heat. * Any stay less than 6 nights will incur a $75 house cleaning fee. *Florida Sales and Guest Tax is 13% There are no other hidden charges. Everything else is included.